RetroBlast! is a place for news and reviews about all things related to retrogaming. What's retrogaming, you ask? Well, thanks to a dedicated group of hobbists, programmers, and preservationists, it is still possible to play practically any video game ever created, even games that were written for computer or arcade systems that are no longer available (thanks to the use of emulators, which recreate virtually the old hardware on more modern computing equipment). Other enthusiasts have worked to preserve the original pinball machines and other coin-operated machines once found in the arcades. Retrogaming, at least for me, is a never-ending quest to reproduce the joy of playing those old videogames, pinball machines, and other coin-operated entertainments as they were originally experienced in the arcades, whether through preservation or emulation. RetroBlast is designed as a resource for the home arcade enthusiast — there are reviews to help with purchase decisions, “How-To” articles, retrogaming news, and more. 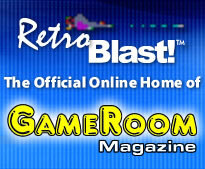 Through both written reviews and videos, RetroBlast is designed to help both the novice and the expert retrogamer build the gameroom of their dreams. Kevin is the owner and publisher of GameRoom Magazine, and an avid retrogaming enthusiast, particularly of arcade video games and pinballs. He created RetroBlast nearly three years ago as a way to document and share his experiences in his never-ending quest to create the perfect "home arcade," full of both classic arcade and pinball games as well as modern reproductions of the arcade experience. Kevin's current home arcade consists of the MAMEframe II, a MAME arcade cabinet capable of playing over 4,000 arcade videogames, a Quasicade 2 arcade system (an advanced arcade cabinet designed for consoles such as the XBox), a 1996 Bally "Attack from Mars" pinball, a 1993 Bally "Twilight Zone" pinball, a 1992 Bally “Doctor Who” pinball, and several Pachinko and Pachislo machines. More machines are inevitable. Growing up walking distance from Coney Island in Brooklyn it was pretty much a given that Mitch would end up loving video games. Having spent countless hours pumping quarters into the boardwalk arcades and buying the various consoles over the years he still dreamt of someday owning a real arcade machine. Having discovered MAME™ about 3 years ago his new hobby grew into a true obsession and Mitch is now the proud owner of a kit built cocktail machine, rebuilt Stargate stand up (both running MAME™) and now more recently 3 Japanese Pachislo Slot machines (Metal Slug, Tekken and Jet Set Radio). 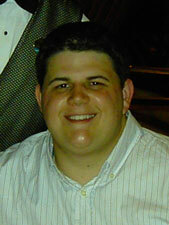 Jonathan, who grew up in Jamestown, ND, has been playing arcade games since before he could walk. 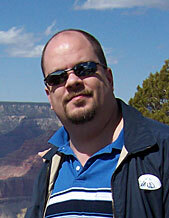 Jonathan now lives in Fargo, ND and travels extensively as a professional sign salesman. Pac-Man has always been, by far, his favorite video game, and has even earned him the famed nickname. Through Coin-Op TV Jonathan has found a new creative outlet and the chance to reach millions of other arcade enthusiasts. James discovered MAME in the late '90s at a friend's house, but it wasn't until the past two years that he became obsessed with playing, restoring and promoting classic arcade games. 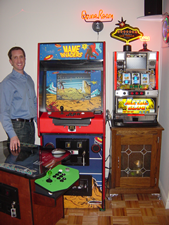 James currently enjoys playing classic games through MAME on a cocktail table and a home-brew upright cabinet. One day he will finish restoring an Operation Wolf cabinet that currently resides in his garage. In his "free time", while not playing games or write about them, James runs a marketing and public relations agency dedicated to promoting small business owners - especially those in the coin-op and home recreation industries. Once out of college he found himself with a bit of extra time and income, and realized that a MAME cabinet would be the best way to get rid of both. His current cabinet is a cut-corner Dynamo running MAME via an Ultimarc J-Pac and ArcadeVGA. 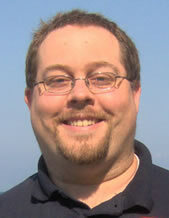 Among his favorite games are Kung Fu Master, Track & Field, and most of the Street Fighter series. In his increasingly rare spare time that isn't used up by gaming, he enjoys disc golf and directing amateur special-effect-laden short films, and vows to one day own an Indiana Jones pinball machine (if he can only con his lovely and infinitely-patient wife Karen into it, that is). All Site Content Copyright © 2003-2006, by Steele Publishing, LLC. RetroBlast! is a trademark of Steele Publishing, LLC.